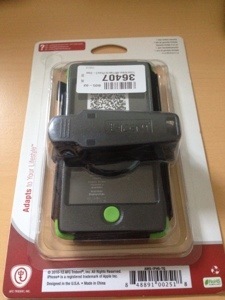 Today I received a Trident Kraken iPhone 5 case. I was looking forward to this case but was somewhat disappointed in the end. I already have two Trident Aegis cases, one in blue and the other in black. These I love. They provide a good 2 stage protection of silicone and outer plastic, with all the ports protected with flaps. The Trident Aegis pictured below has a large enough opening for all my headphones. It uses comes with a good screen protector as well. The Trident Kraken shown below, is slightly different. It is a 3 piece case. Silicone and 2 pieces of plastic, one for the back, the other on the front. It also features a flip out stand, which clips on to the modular connection on the rear. With this modular system you can attach a variety of add ons from bicycle mount to a windscreen mount and more. Weirdly, the belt clip fastens over the front of the screen. Bad design as to use the phone you have to remove the belt clip. The other poor design is the headphone flap. It’s too small to fit most headphones so you have to use the supplied adapter tool. However when I used this adapter with a number of headphones the sound only came out of one side. 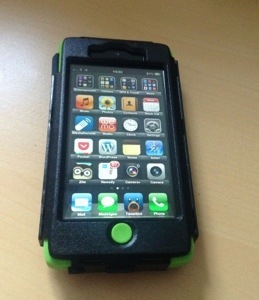 The other positive aspect of this case is the built in screen protector. There were no issues with this at all. Just one small point, the case weighs 78g without the belt clip. So the combined weight with the iPhone 5 is 199g. In summary, if the Kraken had a larger headphone flap, this would be a keeper. But it doesn’t so I can only recommend this case if you don’t listen to music. The Aegis is superb. 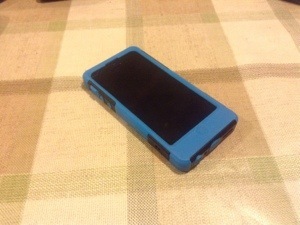 Nice case, but I prefer the Pong Research iPhone case. I read that the cell phones emit a dangerous non-ionizing form of electromagnetic radiation; radiation which can be absorbed by the tissues and cells which come into close contact with the phone. That’s why I decided to do something that reduce cell phone radiation levels for protect to my family. In the end though, I found a couple of reviews of Pong Research’s cases, that convinced me to give it a try. This case is built with an antenna in between layers of the back cover, which reduces exposure to radiation while optimizing the mobile reception. Will this case fit the 5S? Yes. But finger scanner is covered.